Girl Power! 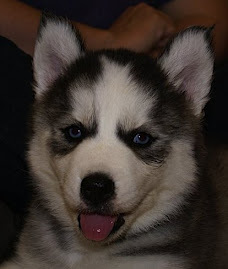 I'm a Siberian Husky planning to take over the world. I have two German Shepherd pack brothers, a German Shepherd pack sister, two litter brothers that blog, and a stinky new rottenweiler pack brother. We have a new friend in the pack! Her name is Nadja right now, but the moms are calling her Ziva. She's a German Shepherd, and she's about 6 months old. The moms said something about her being rescued, but I dunno what she needed rescuing from. Maybe she was stuck in a tree or something. She likes to do super zoomies and bitey face just like me!! Mommy Cate also stole a BUNCH of my fur. There are pictures of that too. We're all really sad that our friend Dakota went to the Rainbow Bridge. We love and miss you Dakota!